Spray Bug Ban in any direction, thanks to the specially made valve system. Its non-oily formula won't stain clothes, but it will take care of mosquitoes, biting flies, ticks, chiggers, fleas and more. 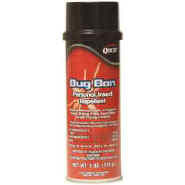 Bug Ban contains 14.25% DEET and Bug Ban Plus contains 22.56% DEET, plus two other repellents to keep bugs at bay. 8 oz cans make it easy to take along.